The city lies just north of the Arctic Circle where the midnight sun is visible from June 2 to July 10. Due to atmospheric refraction, there is no true polar night in Bodø, but because of the mountains south of Bodø, the sun is not visible from the city from early December to early January. 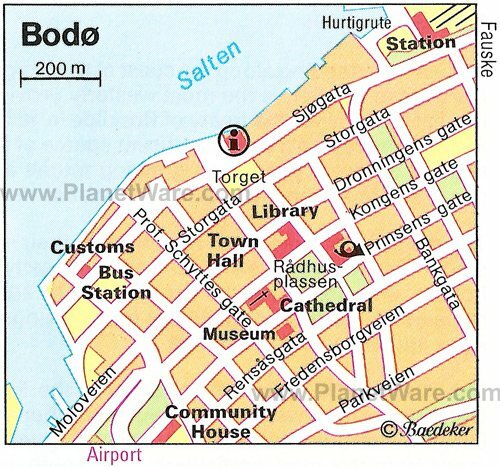 Most travelers only pass Bodø on their way to the Lofoten islands. Bodø is the largest city and capital in the county of Nordland in Norway. Its population is above 45 000 people, which makes it the second largest city in Northern-Norway, beaten only by Tromsø. Norsk Luftfartsmuseum, The Norwegian Aviation Museum. Located in the shopping center area, a 20-minute walk from the city center, you can visit a quite large museum and experience the history of aviation and highlights from the Cold War. Taxis are also available, but with typical Norwegian prices, you should be cautious about using them on longer trips. A 10 km trip costs about 200-250 kr in a normal size car, and you pay for the trip, whatever the number of passengers. A full car, four people, will often be cheaper than bus fare, to a certain point. 10 kilometers north of Bodø lies the popular recreation area Geitvågen. The area is inhabited by a large number of White-tailed Eagles.